Revealing For the First Time Ever Before a Third Dimensional Level of Consciousness, the Greater Cosmic Secrets of Creation. The Piscean Age has ended and the Age of Aquarius is upon you. The 'Great Book' is being opened. The great Mysteries of the Cosmos are at long last starting to become revealed. The Waters of Truth have begun to outpour and will continue to download expansively into your consciousnesses as that called Illuminations. The 'Great Book' is being opened at last and for the next two thousand years you will be expanding in consciousnesses all the way. By the end of Aquarius you will have been raised back up to the fifth dimension where you belong. 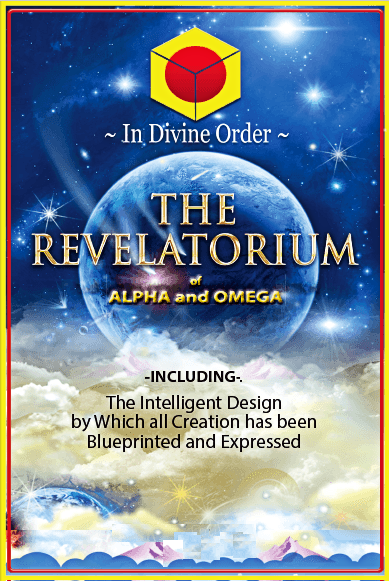 The Revelatorium of Alpha and Omega is a revelatory illumination whose purpose is to help you dissolve your Mentallized Illusions of who and what you are, plus your misguided conceptions and understandings of the past. It is also to introduce you to the Great Cosmic plans already in progress which underscores your future. Also, to re-align you back out of your attunement to the planet and back into harmony with the Creators where you should be. Earth is at a major pivotal point in its history which will never be repeated again. It is because the Adamic Root Race is finally starting to be lifted out of the third dimension back into the fifth dimension where they belong after three and a half million years in a third dimensional mire. It is also because Beings of all dispensations have volunteered to come here from all over Creation to help in the raising up of the Adamics. It is also because Plant Earth is starting to come into its own final run unto a radiant Protostarr in the womb of Orion two hundred and fifty hundred thousand years from now. It is also because the accumulated lesser condition of people with contaminated consciousness's resulting from the Luciferian Self Will Rebellion of the Cosmic Overplus five billion years ago have been gathered together and cast into Earth as the 'Casted Dagon'. Who incarnated as that called the Baby boom. It is also because the clean up in the aftermath of the Luciferian Rebellion is now occurring throughout the thousand galaxies of the Local Universe which were all that were effected, as that called 'Armageddon'. It is also because a vast Heavenly Host of Millions upon millions of upper level fifth dimensional Radionnic Ships are in orbit outside Pluto to help in the Clean up. It is also because the Age of Aquarius has started and the one hundred and forty thousand Energy principles of Galactic Law called 'The Chosen Ones' are starting to become installed in your mass consciousnesses. It is also because a whole new eighth and great new Anti-Matter Super Universe of Intelligence is being initiated by burfication off this Local Universe and Earth is right in the middle of the point of burfication. It is also because Earth was the training sphere where the seed Soul Atoms for the New Creation were being prepared. The fall of Man into the third dimension three and a half million years ago was a mishap, now being corrected. It is also because volunteers from all over Creations are also currently on Earth learning how to work with a Cosmic Overplus additive within a fully Triune Attribution. It is also because Earth has entered the great Photon Disk around the great central Starr Alcione in the Pleiades System, where it will remain for the next two thousand years during the installation of Galactic Law. It is also because a new Day cycle of twelve two thousand year dispensations officially started on December twenty first, two thousand and twelve. It is also because after a two hundred and fifty thousand year delay, the magnetic poles of the Earth are starting to reverse. It is also because a new Cosmic cycle of two hundred and fifty thousand years has begun. It is also because a new Galactic cycle of two hundred and fifty million years has begun. It is also because a higher frequency Energy burst from the Galaxy's central core has just passed through Earth which is an Energy enrichment all evolutionaries in the fifth dimension of every Planet in the Galaxy receives on a regular cyclical basis. It is also because for the next two thousand years during the Aquarian Age, illuminations in consciousness will be constantly downloading known variously as 'The Great Book' being opened at last, 'The Greater Truths of the Cosmo' finally being revealed, and the outpourings of 'The Waters of Truth'. It is also because a huge induction of unprecedented high frequency radiations are starting to come in now to affect the changes. It is also because Planet Earth is finally coming back into proper polarity alignment with Polaris, whereby Earth has been suffering a reverse Polaris Ionnic condition for the last two hundred and fifty thousand years. And finally, because your old ways of livings for the past three and a half million years is ending and a new way is coming in fast through the Age of Aquarius, the Revelatorium of Alpha and Omega has been given by grace as a vanguard to prepare you by giving you a proper upper fifth dimensional based language and conceptual structure to work with in harmony with the higher frequency vibrations of the fifth and seventh dimensional ways of consciousness which you are starting to experience as 'Illuminations'. Two thousand years ago, through an outward action Christ broke you free from the lower precepts of a fearful God and binding religious intolerance into the Reality of a Loving god and spiritual practices free from ritual and superstition. Today the Revelatorium is a continuing inner action to break you free from the limited religious precepts and intolerant practices which have encroached today into the positive and ever expanding Realities of the future through the Age of Aquarius and its ever expanding outpourings of the Waters of Truth. The Revelatorium is a full Christ Melchizedek teaching. Christ teachings deliver new levels of understanding into consciousnesses which are otherwise vacant. The Triune Being Jesus Christ gave a Christ teaching to his disciples two thousand years ago. A Christ teaching was given to a small handful of the Elect of Christ in the early seventies. The Revelatorium is a Christ teaching being given for those of you now who have risen up enough in consciousness to want to know what is going on in the higher Realities and your role in them. The Revelatorium is on the Christ Table as is and fulfills no other purpose. The Great Cosmos at large is called 'Reality'. Reality comprises all eighteen dimensions of the Creators and includes the nine hundred trillion light year wide Universe your Soul Atom is privy to on the other side of the veil. The Revelatorium of Alpha and Omega is about Reality. The Revelatorium also introduces for the very first time ever before Mankind, the complete Intelligent Design by which all of Creation has been blueprinted and expressed. Also revealed for the very first time ever before Creation at large is the Great Cosmic Plan of the Creators, including the birth of an eighth and great new Super Universe now beginning to unfold off this Super Universe by bifurcation. The current affairs on Earth are no trivial matter as you are right in the middle of the point of bifurcation and have a vital role to play. Your accumulated misconceptions and misunderstandings for the last three and a half million years, called the 'Mentallized Illusion' are starting to become dissolved. You are beginning to be raised back up in consciousness to the higher fifth and seventh dimensional awareness's of your calling. The Revelatorium of Alpha and Omega is a true Christ teaching through Melchizedek attunements in consciousness, teaching you what you should have been taught and not what you have been taught. The material in the Revelatorium could not have been presented to you earlier as your consciousnesses would not have been able to absorb the information properly. It can't be given to you later as it will be too late. The Revelatorium self-contests all your known acorns of Religion, Science, and Metaphysics by presenting the greater facts of Reality as they really are as seen through fifth and seventh dimensional eyes and not through the lesser eyes of your 'Mentallized Illusion'. Which you currently consider to be the totality of all that exists. The Holy Trinity is not a Father, Son, and Holy Ghost as you have been led to believe, it is a family principle of Father, Mother, and Only Begotten Son/Daughter. 'As above so below'. The Holy Trinity occupies the totality of the fifteenth dimension and are not materialized. The personae of the Only Begotten Son/Daughter is 'Christ'. The personae of the Father is Alpha, the personae of the Mother is Omega. Together they are called, 'The Creators'. 'God' is your accumulated greater faith looking towards the Creators Alpha and Omega. Likewise, the 'Fountain of Youth' is not a magical spring somewhere in Florida, it is a flow of your seminal fluids up your spine. Likewise, the 'Arc of the Covenant' is not a scroll in a box, it was an agreement in consciousness between God and the Israelites. You have a lot of illusion to translate. Do not let the religious overtones of some of the Starrgram topics put you off. The Revelatorium is anything but a religious tome. The first paragraph of every Starrgram proves the point. Likewise, the Revelatorium is on the Christ Table as is and has no other reason or self serving purpose. You are well advised to read the Revelatorium all the way through and question your beliefs rather than to rely on your beliefs and question the Revelatorium. The Revelatorium is a Christ Melchizedek teaching which has been given by grace from the Melchizedek Worlds of the Magellanic Clouds for the benefit of all Humanity and is not intended for self gain or malpractice. Nor is it to be used as fodder for a church. Also, please note that 'The Revelatorium of Alpha and Omega' is a revelatory presentation and is Volume 1 of a three volume set. Volume 2, 'The Intelligent Design of Creation' is also revelatory, disclosing the Intelligent Design by which all of Creation is blueprinted and expressed. 'The Radionnic Ships of the Heavenly Host' is Volume three, and also comprises a revelatory disclosure. The indexes of all three are presented at the right hand side of every Starrgram for your convenience. Also please note that 'The Revelatorium Revelations' are on the Christ table 'as is'. It is not a scholarly work. It is not intended to stir up a dialogue or controversy. Nor is it a doctrine or personal belief. Nor does it represent a new philosophy, religion or group. Nor is it to be used as fodder for a church. It is a pure Christ teaching to help in your ascension to the fifth dimension two thousand years from now and serves no other purpose.